It wasn’t how Quinnipiac coach Rand Pecknold drew up his 700th game behind the bench. The 20th-year coach saw his team lose its early two-goal lead on a pair of second period Clarkson scores. Quinnipiac, however, would find a way to finish with two points, defeating the Golden Knights 6-3 in front of 3,542 Friday night at TD Bank Sports Center. 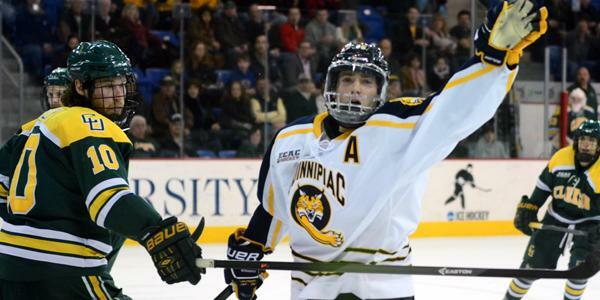 The two teams combined for 30 penalties, 12 of which from Quinnipiac. Matthew Peca recorded two goals and one assist, while Travis St. Denis added three assists of his own. Jones began the scoring just 10 seconds into regulation, becoming the first player in NCAA history to score within the first 10 seconds of a game twice, after achieving the feat for the first time last weekend at Dartmouth. Peca then followed with his second goal in as many games. St. Denis sent a behind-the-back feed to Peca from the goal line, who wristed it top shelf for the two-goal lead. After two quick Clarkson goals early in the second period, the Bobcats rattled off four answered scores, beginning with a Cory Hibbeler goal from the slot. Peca then earned his second goal of the evening, after cleaning up a rebound. Bryce Van Brabant and Kellen Jones each tallied goals in the third period, padding the Bobcats lead. For Kellen Jones, it was his fourth short-handed goal of the season. Quinnipiac goaltender Michael Garteig made 15 saves on 18 shots.